Zinfandel is one of the earliest recorded grape varietals for viticulture in the world... anthropologists have discovered evidence that places the first Zinfandel wines at approximately 6000 BC. Six millenia of winemaking using just one varietal would lead one to think that it must be an incredibly popular varietal. Why haven't you heard of it before? Well it all likelihood it's because Zinfandel wasn't always and isn't always called by that name. In the Puglia region of southern Italy it's known as Primitivo, and it Croatia (from whence it is believed to have originated) it is known by the impressive title Crljenak Kaštelanski. And that's just the main names; Zinfandel actually has over 20 synonyms many of which bear absolutely no resemblance to the original. So what's the story behind this grape? Well Zinfandel is thought to have been brought across to North America from Austria when the Austrian Empire held territory in Croatia (early 1800's). At that time, much American viticulture was centered around the Boston area (yes seriously) and done in greenhouses. And so began the American saga of the mighty Zin which went on to be planted to much success in California in the mid-1800's and then ripped out during the Prohibition Era of the 1920's and then replanted during the great growth period of Californian winemaking in the 1970's and 80's. But who would think it would grow well in British Columbia? A serious question, worthy of serious consideration and a serious answer: No One. That's right, no one. When winemaking truly began to flourish in British Columbia in the 1990's, and the growth of new wineries was so remarkable that even the mighty John Schriener (http://johnschreiner.blogspot.com/) is known to have said on more then one occasion "It's growing so fast that even I find it hard to keep up." At that point in BC's winemaking - no one believed that Zinfandel could truly be grown to any great success in this climate. No one should have told that to Inniskillin wineries *(www.Inniskillin.com) or their winemaker in the Okanagan Valley, Sandor Mayer. 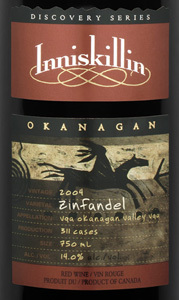 Vincor, which owns Inniskillin wineries, planted their first Zin vines at the Bear Cub vineyard near Osoyoos in 1999 and in 2002 they released their very first (small lot) vintage through their Discovery Series. The Discovery Series was started, in their words, with the express purpose of cultivating grape varietals not typically grown in the Okanagan. These releases are usually small in nature, and designed more to enlighten us to possibilities rather then a money-making scheme (in my eyes). Well, although this wine is much more in keeping with a cold-climate wine then the fully intense flavors I'm used to from California's Santa Clara Mountains AVA, or the Dry Creek AVA, it is full of nuanced flavors, structure and balance. This is certainly it's own rendition of a classic grape passed down to us from the dusty past, and one that I'm very glad Inniskillin wineries and Sandor Mayer have taken the time to - discover again. Primitivo, Zinfandel, I don't think it much matters what you call it.... people around the world have been enjoying this wine for thousands of years, and now BC winemakers are starting to let the terroir here express itself in a new and exciting way; through a venerable and well deserving grape. Thanks again Inniskillin ~!